Day 1: Join your charter yacht in Ostia, just 20 minutes from the center of Rome, and 20 minutes south of the Fiumicino Airport. 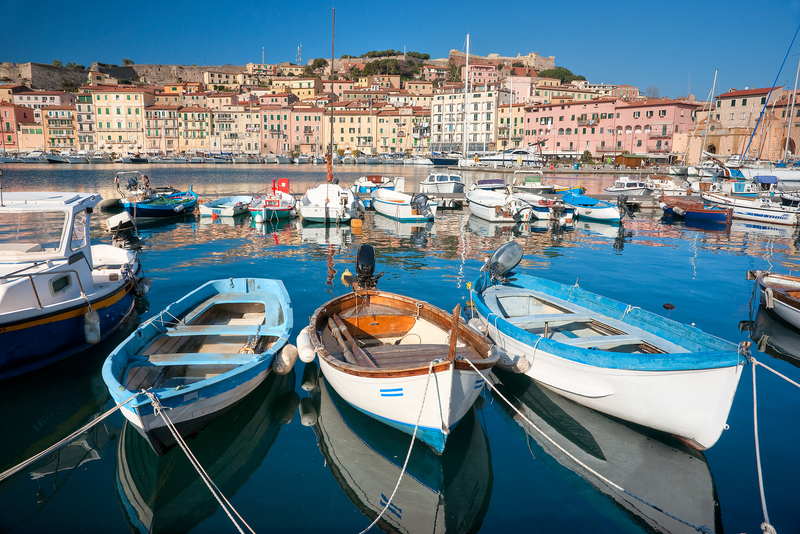 After settling on board, cruise to Porto Ercole on the southern side of the Argentario Peninsula, guarded by medieval fortresses on either side of the harbor entrance. Anchor and enjoy swimming and water sports. Later in the afternoon head ashore in the ship’s tender to visit this tiny little very traditional fishing village. Stay overnight on anchor or perhaps in Cala Galera Marina. Close by is the highly regarded restaurant Il Pelicano. Have dinner at Il Pelicano or On board. Overnight. Day 2: In the morning cruising around the headland of the Argentario Peninsula, stopping to anchor for lunch and a refreshing swim and water fun. 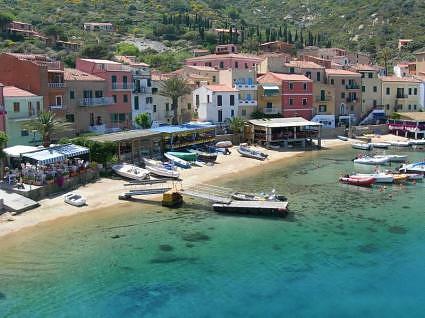 In the afternoon cruise to Porto San Stefano and anchor or come in stern to along the main street quay. 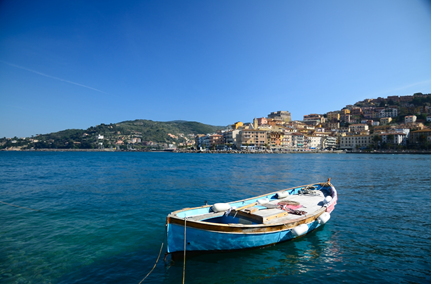 Head ashore to explore the bustling little village. After dinner, the main street is blocked are to traffic and becomes a walking street. Café tables and chairs pop up on the street. After dinner, walk along the main street sampling the local nightlife, or settle into a café table and chairs, have a drink and watch the local world go by. Stay overnight in Porto San Stefano. Day 3: After breakfast, depart for Porto Azzurro, Elba. 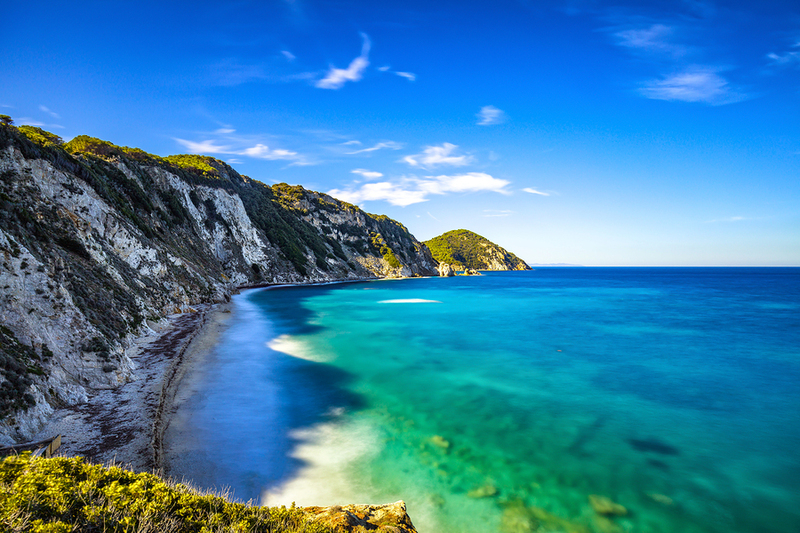 Located to the west of Italy, but close enough to have been inhabited since ancient times, Elba is the largest island in the Tuscan Archipelago. 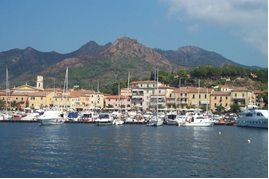 Porto Azzurro is a lovely harbor where hill-houses in pastel colors frame the harbor. Anchor in the large harbor area and enjoy water sports. In the late afternoon head ashore. Roam around the lively piazza Matteotti. 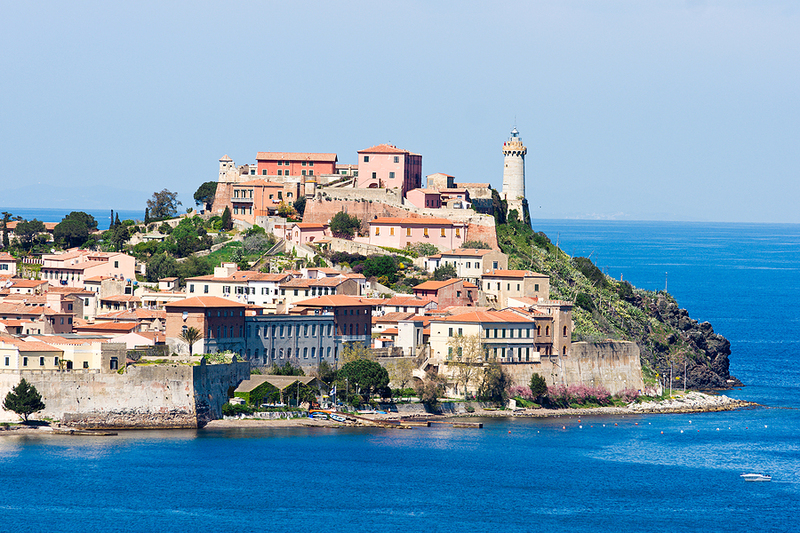 Other areas worth visiting are the Fortresses San Giacomo and Del Focardo, built in the 17th century by the Spanish, and the Sanctuary della Madonna del Monserrato that can be reached by taxi. Wander the back streets and poke into shops selling traditional pottery, and other local goods. Dinner on board. of that time, Napoleon escaped to France and renewed his power. 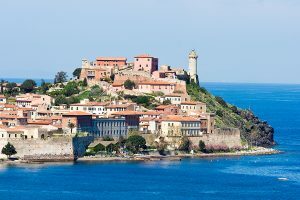 Elba is a very large island covered in pine trees, with a network of trails for hiking and Cycling. This is a nice island for a bicycle ride through the interior of the island. While Portoferraio keeps family hours and is mostly closed by 9:30 at night the hill town of Capliveri has a lively evening buzz. Overnight. Day 5: In the morning cruise to Porto di Capraia. The island has remained practically untouched and is wild with coasts overhanging the sea and a single sandy beach, Mortola, which can only be reached from the sea. The very small harbor, Porto di Capraia, is connected to the village by the one and only paved road on the island. The village, dominated by the San Giorgio Fortress, preserves its original characteristics with thick-walled houses both to protect them from possible invaders and to keep the rooms cool in the summer heat. The pastel colored facades, the wide terraces and the bougainvillea pergolas complete the charm of these typical island houses. 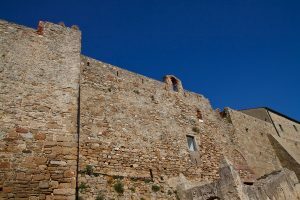 Places to visit in Capraia include the Torre del Porto, erected in 1510 next to a Franciscan building in order to work as a guard for the small bay and as a bastion to the San Giorgio Fortress. 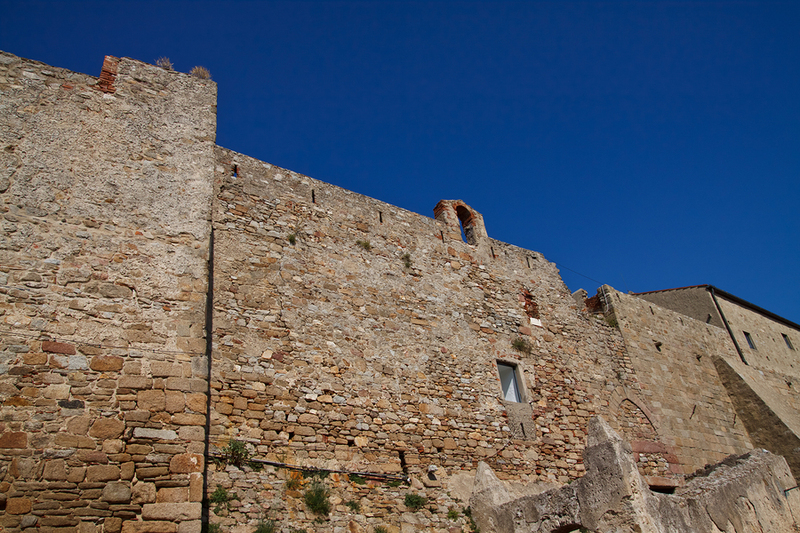 The fortress San Giorgio, solemn and majestic, dominates the village Capraia, but cannot be visited anymore. Strolling about the island you also run in to the ruins of Torre della Regina, located on a peak with the same name, a withered stone construction, Torre dello Zenobito, on the southern top of the island and the charming church Santo Stefano Protomartire. On Piazza Milano you will find the San Nicola church, built in 1759 and embellished with pearl-colored church ornaments made by artists from the island. Overnight. Day 7: Awake to spend the day exploring Giglio. This quaint little fishing island is crowned by a walled medieval village, which is well worth visiting as a more rustic traditional version of Eze, however with far fewer tourists. Giglio Castello is on top of the tallest granite mountain on Giglio. With very few tourists on the island, there are few taxis and the easiest way to visit this medieval gem is to take the bus up the narrow winding road from Giglio Porto, the main harbor. The oldest town on the island, Giglio Castello is still humming with activity while the residents continue to go about their daily activities. The main gate dates to the 1300’s and opens to a town of buildings jumbled on top of one another separated by a maze of alleys and narrow streets. Explore this area by wandering, as getting lost is impossible, and stop for a bite to eat at one of the local eateries inside the walls for a taste of the strong local wine called Ansonco and hearty country Italian food. In the afternoon to cruise to Giannutri for a quiet anchorage and moonlight dinner. Ashore on this tiny island are the ruins of a Roman villa as just like the rest of the islands in this area, the Romans found the beautiful locations to enjoy thousands of years ago. Enjoy swimming and water fun. Overnight. Day 8: Cruise to Rome and disembark in Ostia just outside of the Rome Fiumicino Airport or Rome itself.